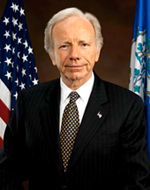 Joe Lieberman announced that he would support a filibuster against the health care bill that Harry Reid announced yesterday with the public option with the phony "opt out" provision." Thus, the 60-vote bluster bursts like a soap bubble. Only the most unprecedented brass would try to pass this on reconciliation, and I think that would require a fine razor, not just to scrape support together but to threaten a few necks. A lot of Democrats won’t go there. There have been other matters on which Lieberman has shown a sober conscience, though he is of course, “pro-choice,” which speaks to me of utter constitutional and moral oblivion. I’ve always reasoned that in Connecticut politics, being "pro-choice” was simply the price of admission. Perhaps otherwise, Lieberman might be more agreeable on the matter? I do know that while Lieberman always turns in his “pro-choice” vote when the issue is before The Senate, he NEVER appears to defend that position on The Senate floor. Anyway, this is a pretty stiff rap to a “public option” in a health care reform bill. Of course, Lieberman has stood with Republicans and George W. Bush in action against Islamic extremism and endorsed and campaigned for John McCain in 2008, all of which won him a challenge and loss for renomination as a Democrat. He ran as an Independent and WON, which makes this action a. I consider myself philosophically meticulous, but except on essential issues (like human life – I could never vote for Lieberman), the only thing more important is a stout and consistent conscience, which is why along with a stellar record against taxes and spending along with his foreign policy positions, I supported McCain, though I disagreed with him OFTEN. But, Lieberman has shown a considerable measure of that sobriety and consistency. For his resolve on terror and this shot against the “public option” in health care, Lieberman is the mensch.